Upon arrival at Bangkok airport meet our representative at ATTA counter out side custom area. Transfer to pre booked Hotel in Pattaya. 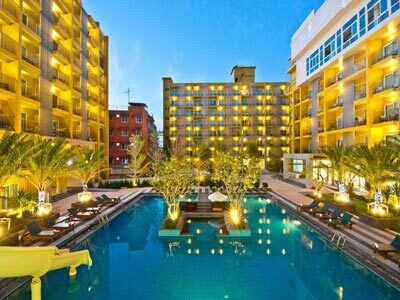 Bella Express Hotel is a modern hotel located in the Central area of Pattaya! The hotel can be accessed both ways from Pattaya 2nd road (opposite Soi 8) and Central Pattaya Road. Only 10-15 minutes walk to the Walking Street and only 10 minutes walk to new Central Beach Festival. Bella Express Hotel is surrounded by the city's famous tourist attractions and gives everything tourists need for a relaxing holiday. The Standard room with City view is 28 sqm big. The room is designed in a modern and clean interior design, a bathroom with shower (hot and cold water) and soap, toothbrushes, cotton buds and a shower cap. All rooms have a TV with remote control with all the Thai, Russian, and many international TV channels, movie channel and local Pattaya News. There is a safe available with room with personal code, that can fit a normal laptop. Also in the room is Airco with remote control, a hairdaryer, Tea and coffee maker, a refrigerator and two bottles of complimentary water. The Superior room with City view is 30sqm big. The room is designed in a modern and clean interior design, a bathroom with shower (hot and cold water) and soap, toothbrushes, cotton buds and a shower cap. All rooms have a TV with remote control with all the Thai, Russian, and many international TV channels, movie channel and local Pattaya News. There is a safe available with room with personal code, that can fit a normal laptop. Also in the room is Airco with remote control, a hairdaryer, Tea and coffee maker, a refrigerator and two bottles of complimentary water. Deluxe Room is designed in a modern and clean interior design, a bathroom with shower (hot and cold water) and soap, toothbrushes, cotton buds and a shower cap. Maximum of 1 child below 12 years old can stay free of charge using existing bed but no breakfast. All rooms have a TV with remote control with all the Thai, Russian, and many international TV channels, movie channel and local Pattaya News. There is a safe available with room with personal code, that can fit a normal laptop. Also in the room is Airco with remote control, a hairdaryer, Tea and coffee maker, a refrigerator and two bottles of complimentary water. After breakfast at Hotel. Transfer to Coral Island tour with lunch. (Included in cost) (Pls. be at hotel lobby five minutes before the given time for the prescribed tour) return back at around 2 P.M. Dinner at Indian restaurant. After breakfast at hotel, Tour to Noon Chung village tour (Optional) or free to enjoy the Pattaya beach at your own way .Lunch and dinner at Indian restaurant. After breakfast at hotel. Free time at your own. On time transfer to airport to board the flight for your next destination. 03 Nights’ Accommodation at Selected hotel in Pattaya. Meals i.e. 03 Breakfast at Hotel. Return transfer Bangkok airport -Hotel Pattata- Bangkok airport. Service of local guide in Pattaya.